You was a series I was excited to watch immediately after its episode one airing on Lifetime. Then, all of a sudden, I was in the UK, and there was no way of watching the series legally. I was bummed after seeing what could be a great guilty pleasure. Then, I hear the entire season is on Netflix, and I waste no time binging through the remaining nine episodes. And boy, it was exhilarating. The series stars Gossip Girl’s Penn Badgley who plays Joe, a book store worker who meets a young graduate student, Beck, and instantly falls for her from first sight. Joe starts finding out more about Beck (Elizabeth Lail) , such as a mild social media search and a quick address search in Google maps. Sounds like stuff we’ve all done right? 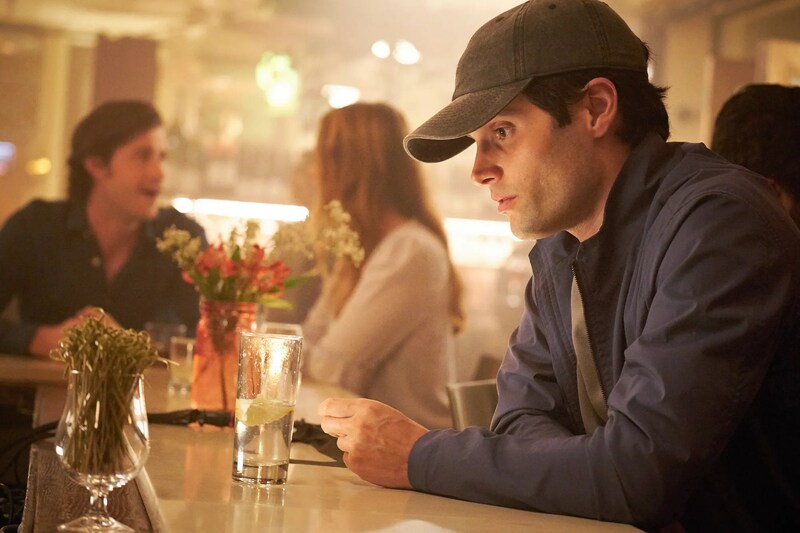 But something isn’t right, as Joe starts stalking her, watching her, breaking into her apartment and a variety of creepy activities in his all black getup and a cap. His infatuation turns into an obsession and the scariest part is that from Beck’s perspective, Joe seems like the perfect gentleman. The series definitely has a Lifetime feel, don’t get me wrong. The show is not something that is always the most smartly crafted series ever, but it really embraces that guilty pleasure feel that I miss in a series. Every episode is unpredictable as Badgley shows Joe’s erratic behavior perfectly through his eyes and clenched demeanor every time something doesn’t go his way. It’s a social media horror story, as Instagram and Twitter become key mediums for Joe to pull off some of his shenanigans. Additionally, it’s relevant more than ever as dating apps and “sliding into the DMs” are the new ways of meeting people these days. The show largely benefits from the fact that Joe is the one narrating every creepy thought he has, and it’s twisted that we can actually empathize with him at times, especially when we see him care for his neighbor, Paco. Pretty Little Liars star Shay Mitchell also stars in the series as Beck’s spoiled Queen Bee friend who is smarter than she appears, as she catches on to Joe’s sketchy behavior quite quickly into the series. John Stamos also makes a surprise appearance as Joe’s therapist late into the series. These guest stars add to the overall drama and both play key roles in how the story unfolds. The 10 episodes fly by quickly, and the ending left me pretty satisfied as the finale escalated to a point when I started saying “How are they possibly going to wrap this up?” If a series has me asking that by the final episode, that’s a good sign. With the twist at the very end, I’m not sure how strong a second installment of the series will do, but I’ll definitely be tuning in to see how the second chapter will go down. I recently visited The Alpaca Shop, where I walked the cutest alpaca. When I first arrived in the UK, I needed a few days to shop for university, so with the shopping and traveling that I’ve been doing, I was feeling very stressed out. This was such a therapeutic experience and the whole thing was one of a kind for sure. There were alpacas when we first stepped foot on the farm and they were a little daunting at first, but we had a great tour guide who explained the rules as we continued to see more and more of them on the farm and how to approach them. These animals are so dang cute and have their own little personalities, so I slowly feel in love with them as we continued. We walked them a descent amount along a path as each adult got to walk their own alpaca, while children had to share one with their guardian. I think that’s pretty appropriate too considering some of the alpacas were larger. As we walked together, our guide was attentive and made sure we all stuck together. There were times when the alpacas wanted to do their own thing. Mine was named Rosa, and she was constantly pooping and stopping to eat, so it was pretty funny to pick up on her cues and habits. Overall, I loved the experience, and anyone who knows me, knows that I’m obsessed with alpacas and llamas, so this was extra special for me. Apparently, these are popular in the UK, so if anyone ever has a chance to check out one of these farms, know you’re in for a very unique trip. Also, the coat I’m wearing is from Boohoo, and it was 50% off online at the time, so I scored it for $30. It’s perfect for London weather. The scarf I’m wearing is from a thrift shop from Burlington, Vermont, but I don’t have any other details on it.